The IQAir Healthpro Compact is designed to remove allergens from the air. It cleans a room the same size as the Healthpro but it comes in a smaller package. This makes it a good choice for a smaller apartment. Unlike the Healthpro, this cannot be upgraded to use the V-5 chemical filter. It retails for $650. This model has a HEPA filter. It is called a HyperHEPA filter. It can remove 99.5% of particles 0.003 microns and larger. The Healthpro has a pre-filter to trap larger particles. It also helps the HEPA filter last longer. There is optional package that can be purchased. It is a washable pre-filter. This will help the more expensive $60 prefilter last longer. It is hard to say how long the filters will really last. This can cause the cost of replacement filters to vary greatly. If we assume a pre-filter lasts 1 year and the HEPA filter lasts 3 years. This would give us an average cost of $120 each year. This is actually pretty expensive to buy filters each year. The Healthpro Compact can clean up to 900 square feet. We feel that this is too large to be effective. At this size there are only 2 air exchanges per hour. In order to get to the recommending 6 exchanges per hour, it should be used in smaller room. We think closer to 300 square feet. The fan can be programmed to run at one of the different 6 speeds at different times of the day. It is 24 inches X 15 inches X 16 inches (H X L X W) and weighs around 25 pounds. The IQAir Healthmate Compact is great for allergen removal. 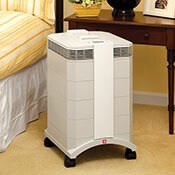 It will clean your air and help reduce you reactions to allergens. This is also smaller so it can fit into a smaller apartment. The biggest drawback is that you can't upgrade it to filter out chemicals. If you only will need allergens filtered out this is perfect. It is cheaper than the Healthpro and it is smaller. See the Healthpro. It offers the ability to upgrade later to filter out chemicals.